This is one of those Holy Days on which the lectionary readings are the same for all three years. But in each year of the cycle they suggest a somewhat different emphasis. Just for reference here is what you will find on this blog for each year. 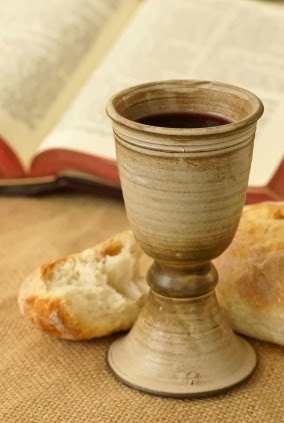 In all three years for children, Maundy Thursday is all about celebrating Holy Communion on the night Jesus invented it. Just as the Nativity stories have special power on Christmas Eve, the Eucharist has added power on Maundy Thursday. Just to be there participating in the sacrament on this night says that I am one of God’s people. Because I eat at this table, I belong. + calling on families with children to serve as greeters and ushers. + Stories are important on this night. The key story is the bread and cup of the Last supper. But the story of washing the disciples’ feet, the failure of the church in Corinth to gather as a loving community to celebrate communion, and the Passover story are also part of the night. And, though the Passion story belongs to Good Friday, all the stories told on Maundy Thursday look to the Good Friday stories. In any given service only one or maybe two of the supporting stories can be involved. + Songs for the evening: “Let Us Break Bread Together” and “For the Bread Which You Have Broken” (especially verse 1, 2, and 4) are probably the simplest communion hymn for this night for children. The Ghanian hymn “Jesu, Jesu, Fill Us With Your Love,” while it may not be as familiar to adults as it is to children, is a good choice for congregational singing or for a children’s choir to sing. -The readings are not too long and focus on storytelling. (This is not the place for John’s long soliloquies.) 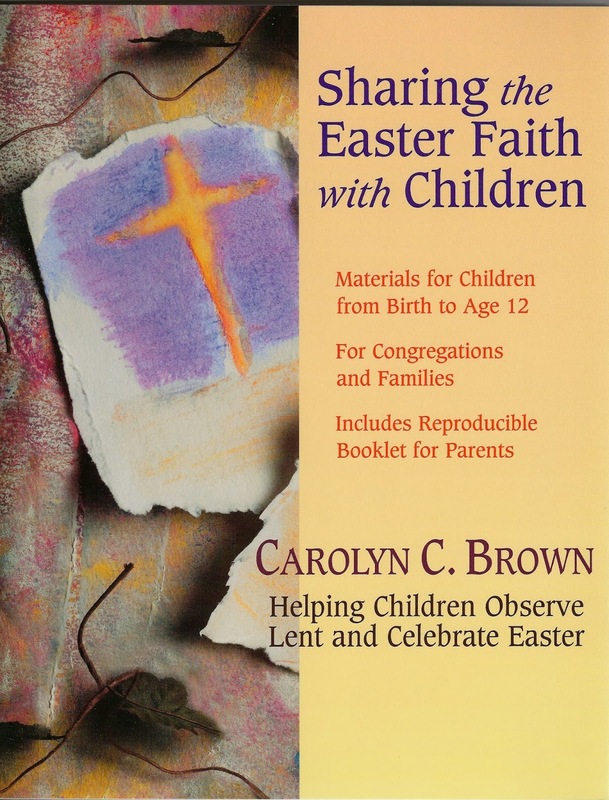 See scripts in Sharing the Easter Faith with Children. + Some congregations end this rite with a minute of silence followed by a single crash of a gong. Even when you know it is coming, the gong makes you jump. Be sure the children know it is coming. A note among the printed announcements is not enough warning! Actually, briefly explaining the Tenebrae and noting the crashing gong at the end of it during worship leading up to Maundy Thursday is a great way to draw families to this service. Older children, especially those who have Jewish friends, are fascinated by the connection between Passover and the Last Supper. But, before they can understand it, they have to hear the story of the Passover, know some of the details of the Seder, and know the details of Holy Communion. Maundy Thursday worship is not the place to start into all three from scratch. What you can do? + Invite the children forward for the reading of the text. Then point out that God saved the Jews from slavery in Egypt. Jesus and his disciples were remembering this story on the night of the last supper. The very next day, Jesus died on the cross to save us from sin and death. Note the similarity. God saves us over and over again. + Before Holy Week, invite a Jewish family to walk families of your congregation through a Seder. They could just tell about it or present pictures of themselves celebrating it (maybe in a Powerpoint?) Or, with their direction you could prepare a Seder meal to eat together with them leading the whole group through it. Then, on Maundy Thursday seat worshipers around tables in the fellowship hall with communion elements on each table. Read the Passover story and the story of the Last Supper before celebrating communion. + Exploring the Passover connection tends to lead adults to speak of Jesus as the Lamb of God. Remember if you do that children think literally and are easily confused by metaphorical language. For them the easiest way to understand Lamb of God is as a nickname for Jesus. Actually, I’d save this term for other worship settings. There are so many vivid stories vying for their attention in worship this night that most children will miss this psalm entirely. That may be just fine. Unpacking it enough for them to understand requires more than it is probably worth on Maundy Thursday. So include it in the liturgy for the adults. When read in its context, this story is the opposite of Jesus washing the disciples’ feet. The wealthier members of the church at Corinth came early with all their food to the church suppers. They did not wait to eat until the poorer members got off their jobs and could come. So, there was often nothing left for the poorer members when they arrived. Paul calls them on their lack of loving care of people in need. + The story of that last meal is at the heart of the day. Children imagine themselves in the room with the disciples eating with Jesus. The Revised Common Lectionary sets John's gospel (with no bread or cup) as the gospel reading for the night. For the sake of the children, you may want to read or tell one of the synoptic accounts in addition. This year read Matthew 26:17-20, 26-30. Sitting around tables rather than in rows of chairs or pews (whether you share a meal or not) also brings the story to life. Using a loaf or matzo rather than wafers brings worshipers closer to the food of that first night. 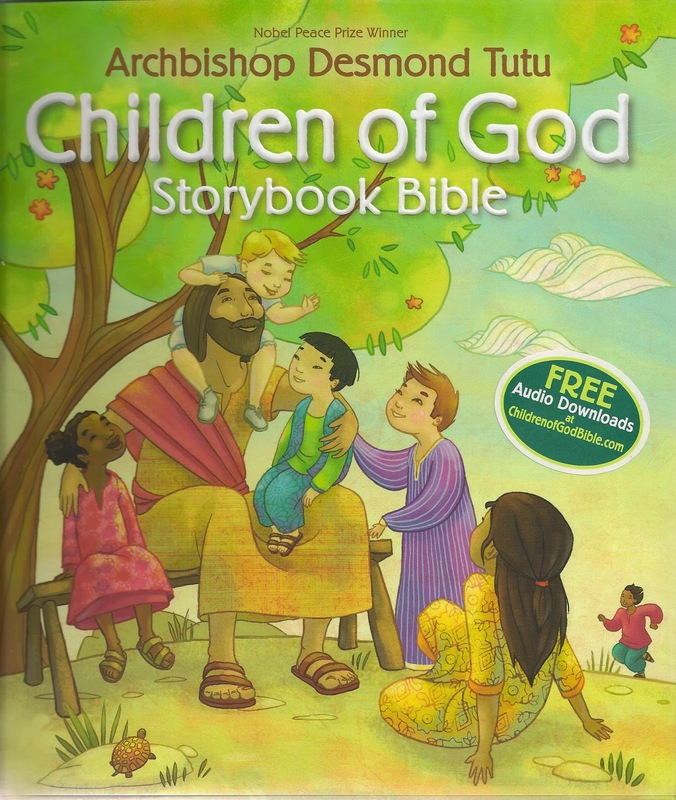 + Bishop Tutu weaves the theme of God’s dream of “all people sharing and caring, laughing and loving” through the stories from the Bible in Children of God Storybook Bible. This theme is especially highlighted in his stories of the Last Supper and Crucifixion (both based on Matthew texts). As he breaks bread at the last supper Jesus says “whenever you break bread and drink wine like this, remember me and remember that someday God’s dream – of everyone sharing and caring, loving and laughing – will come true.” As he dies Jesus prays “Father, forgive them, for they do not understand your dream.” Each story can be read in under 2 minutes. + Use the strong art for the last supper story in this book to explore what everyone was thinking and feeling at the meal. Point out several faces and imagine what the person was thinking and feeling and why they felt that way. The artist has drawn all 12 disciples. Guess together which one might have been Judas. + Jesus Washes the Disciple’s Feet. You can almost see all the disciples looking at their feet, knowing that someone needs to do the washing, thinking that if they don’t make eye contact with anyone maybe it won’t be them. Then Jesus does it. He washes the feet of the people who will desert him. He even washes the feet of Judas who will turn him in and tell his enemies where to find him. I think a case could be made that Jesus did this as either practice for what was coming on Friday, as a demonstration of what it means to love, or maybe both. + Like everyone else in the room, he knew everyone’s feet needed to be washed. Maybe he thought to himself, “OK, if I can wash their feet - even wash Judas’ feet - tonight, maybe I can believe that I can do what is coming tomorrow.” This makes sense to most children. When washing feet is compared to yucky jobs that must be done every day – taking out the garbage, cleaning the cat’s litter, turning the compost pile, cleaning the bathrooms, dealing with a diaper pail – it calls them to join Jesus in practicing love. The first challenge is to do these jobs for people we love and who love us back. As we do we imagine doing them for someone who mistreats us and we remember that Jesus washed Judas’ feet. + While surfing for pictures of foot washing, I came across photos of weddings at which the groom washes the bride’s feet during the ceremony. I’m guessing (hoping!) the groom gets his feet washed too. This is a new idea to me and I’m not espousing it. But it is an interesting wedding ritual that points out the very non-romantic ways husbands and wives (and all family members!) are to love each other. + After washing their feet Jesus gives the disciples and us a new rule, “Love one another as I have loved you.” How do we love one another? We wash their feet and do whatever else is needed (even the yucky jobs) to take care of them. + After washing the feet and sending Judas away to do his deed, Jesus announced, “Now the Son of Man has been glorified, and God has been glorified in him.” Or, “if you want to see the glory of God, watch me wash feet. If you want to share in the glory of God, wash feet like I do.” God’s glory is not seen in people walking on red carpets or standing on championship stands. God’s glory is seen in people taking care of those around them – even washing their feet when needed. This definition of God’s glory is a hard sell with children and worshipers of all ages. Sidebar: Peter was offended by Jesus’ offer to wash his feet. Youth and adults today understand his feelings. But, children are used to being tended in many personal ways. So, Peter’s issue is not their issue - yet. + Display a towel and a basin prominently throughout the service. The picture of the groom washing his bride's feet at their wedding may come from the Seventh Day Adventists, for whom Foot Washing is (or is the equivalent of) a sacrament! Thanks for all of your great ideas for sharing the Gospel with eager kids!